Background — Who was George Sorocold? No visitor to the English county of Derbyshire could fail to be impressed by its civil engineering heritage. Notable sites range from the water-powered Derwent Valley mills that mark the birth of the Industrial Revolution — and are now part of a UNESCO World Heritage Site — to the canals and railways that enabled commerce to thrive, and the three spectacular Derwent dams and aqueduct that supply water to the industrial towns of the East Midlands. It's a shame, therefore, that while names such as Arkwright, Strutt, Bage, Outram, Jessop and Stephenson are well known and respected for their associations with the region, George Sorocold, perhaps the most prodigious of local engineers, whose achievements pre-date the efforts of all of them by more than half a century, remains a forgotten hero. So, who was Sorocold, the man many claim to be the first British civil engineer in the sense that we know it today? Well, one of the reasons that he has been somewhat neglected is that little is known of him, and no known images of him survive. The first difficulty concerns his birth date. Most sources claim that he was born in or around 1668, into gentry stock from Ashton in Makerfield, Lancashire — a small town located roughly between Wigan and Warrington. However, this would have made him a youthful talent indeed, as we know Sorocold received his first major commission in 1687 — at only 19 years old if he was born in 1668. That first commission was a major piece of work, re-hanging huge church bells, a job that one imagines would not have been given to anyone so young and inexperienced. Perhaps a more likely birth date is 1658. On the 18th May in that year, a George Sorocold was baptised in St Mary's Church in Eccles, which is close to Manchester. That would mean his parents were Thomas and Elizabeth (née Shakerley) Sorocold of Barton in Lancashire. 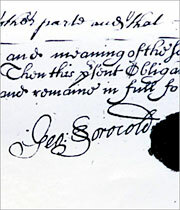 In the Manchester Records Office is a copy of the pedigree of this Sorocold family, and by the record of baptism for George is a note in red that reads: "A famous engineer. He made the water works at Leeds in 1695 and many other places". It has yet to be proved beyond doubt that this record relates to the man who grew up to be 'George Sorocold of Derby'. However, a birth date of 1658 does fit the facts that are known about his career. As a more mature figure, this Sorocold is a more likely candidate for the significant projects later undertaken. A record of the birth of George Sorocold in 1658 is also held in Piccope's Manuscripts Lancs Pedigrees (held in Chetham's Library, Manchester) but without the annotation [see also Sorocold of Barton in Manchester Records Office, ref L1/56/2/21]. A link between the Sorocold family and southern Derbyshire has already been established from before George's birth, as his family were involved in the assignment of the Manors of Etwall and Hardwick in the 1640s, both of which are located in the area. In May 1684, a George Serocold (or Sorocold) of Lancashire was admitted as a Fellow Commoner to Emmanuel College, University of Cambridge, although there is no real evidence that this was the future engineer, or if it was, whether this is where he began to gain his engineering knowledge. No degree was awarded. The title of Fellow Commoner implies that this Sorocold came from a notable family. 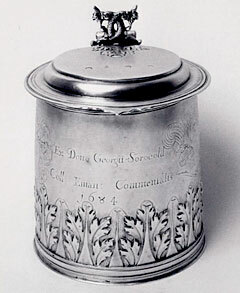 On entry, such a student would present the college with a piece of plate, and an engraved tankard presented by this George Sorocold is still held in the college's collection. If it is proved that he was born in 1658, Sorocold is unlikely to be the donor of the tankard, as he would have been 26 years old at the time — quite late to enter university, for, as now, in the 17th century it was common for undergraduates to enter at 18 or early 20s. As yet, no record has been found of a George Sorocold from Lancashire that matches this age group. The first solid evidence of Sorocold is provided by the record of his marriage to Mary Francis, daughter of wealthy local apothecary Henry Francis. It took place on 7th December 1685, in All Saint's Church, Derby (now Derby Cathedral). At the time of the wedding he may have been a stranger to Derby, as his name is recorded as George Sorrowcald. The marriage appears to have been happy and successful. A contemporary acquaintance, Ralph Thoresby (1658-1725) — antiquary, topographer and Fellow of the Royal Society — wrote that Sorocold married young and that he had 13 children by the age of 28 years. His marriage to Mary was therefore unlikely to have been his first. This, or evidence of all 13 children, has yet to be confirmed. Meanwhile, the baptisms of three children — George, Elizabeth and James — are recorded in the records of St Alkmund's Church, Derby, between 1685 and 1689. The records of All Saint's Church include the baptisms of a further four children between 1691 and 1695: John, Mary, Catherine and William. Tragically, the funerals of Catherine and William are also recorded, within days of their births. James' funeral is recorded at All Saint's for 1699, when he would have been 10 years old — a reminder of the high rate of infant mortality that late-17th century parents faced. Little else is known of Sorocold's background. However, he was undoubtedly a well-respected middle class man and he would gain a national reputation through his successful waterworks engineering. Some time after 1700, he moved to London where he worked on the waterworks associated with Old London Bridge. For this he was under contract to wealthy goldsmith Richard Soame. However, this is jumping ahead. Although it's not known how he acquired his training, there is some speculation that it may have been at Middleton near Wirkworth, north-west of Derby, under Cornelius Vermuyden II, son of the drainer of the Fens, or his assistants. This too is unconfirmed. Sorocold is reported to have worked on a water supply scheme at Macclesfield (1685-7) but the first tangible evidence of his skills is in Derby, where the bells of the church in which he had been married needed his attention. This tankard was presented to Emmanuel College, University of Cambridge, in 1684 by someone called George Sorocold — it was usual to present a piece of plate on entry. However, if the revised birth date for Sorocold the engineer is accepted (1658), the tankard may have been presented by another, as Sorocold would have been quite old to attend. No degree was awarded in the name.